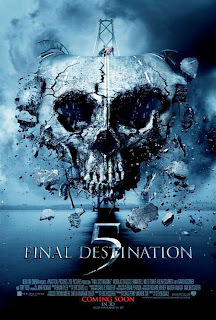 Despite the rather definitive sounding title THE FINAL DESTINATION, 2009's fourth installment in the popular horror series turns out not to have been the last. Since these movies just keep re-using the same script, is it okay if I just recycle my plot synopsis from the last one? Cool. While at a racetrack on a company retreat, Nick (Bobby Campo) Sam (Nicholas D'Agosto) has a premonition that one of the cars will crash into the stands a bridge will collapse causing considerable death and mayhem. He makes a scene, and, along with his friends and a few other spectators passengers, leaves the track bus just in time to miss seeing the vision come true. Any relief is short-lived, however, as the survivors soon begin dying in various grisly ways. 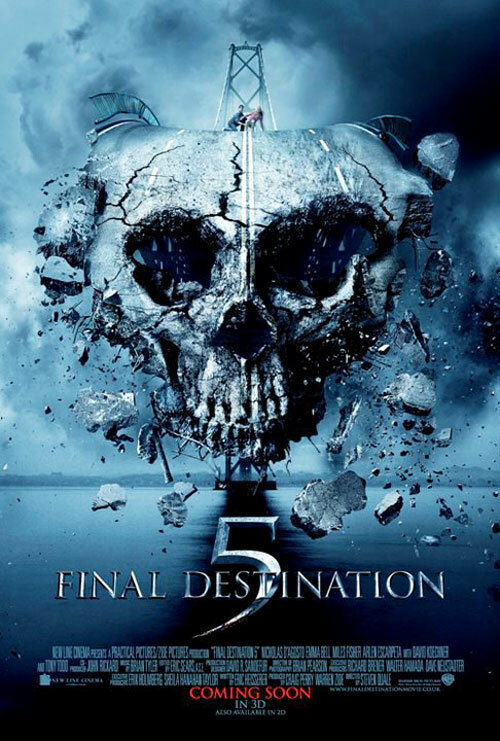 Okay, now that I've got the snarkiness out of my system, I've got to admit that I had a pretty good time with FINAL DESTINATION 5. That wasn't the case with the previous installment. I still think that the premise has gotten stale, but thanks to a little more overt humor and a few particularly well staged deaths that take good advantage of the 3D, this one worked for me as fun trash. There's also one new twist: this time around, a survivor can escape his or her fate by killing someone else, which adds an extra level of tension to the proceedings. The cast also feels a little sharper than most installments in the series, with leads D'Agosto and Emma Bell as his girlfriend Molly coming across as a convincing and likable couple. Comedian and veteran character actor David Koechner also adds some nice comic moments as their type-A boss Dennis, and Courtney B. Vance brings some gravity to his role as a police detective certain there's more than just coincidence at work. Also, after being MIA in the last installment, Tony Todd makes a welcome return as "that mysterious guy who knows what's going on”. I wouldn't say any of the FINAL DESTINATION films are great, but at their best they offer the kind of slick thrill ride horror that has been in short supply this past decade while grittier films like the SAW series and “reality horror” like PARANORMAL ACTIVITY and THE LAST EXORCISM have largely dominated theater screens. You know with this series that you can always count on getting what you expect, and once again that's the case here. I'm sure if this one makes enough money, we'll be getting a FINALL DESTINATION 6. If not, though, there's a surprise ending that ties all the movies so far together and would make this a good place to stop. 3 out of 4 stars.